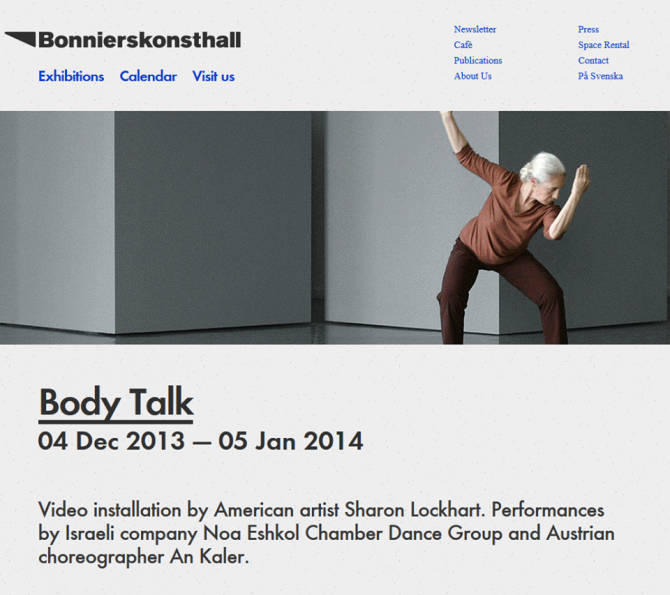 Body Talk includes three elements: a video installation by American artist Sharon Lockhart, performances by Israeli company The Noa Eshkol Chamber Dance Group, and Austrian choreographer An Kaler. Sharon Lockhart, Noa Eshkol and An Kaler share an interest in the particularities of the human body. If there is one common denominator that should be pointed out, it would be their shared sensitivity for how a single body relates to space and given situations. The body is never addressed as something idealised as essential, but rather something that is situated and specific. From that insight the three artists develop their own individual and strong voice within visual art and dance under the title Body Talk. In Four Exercises in Eshkol-Wachman Movement Notation we meet a mature dancer who moves to the simple and rhythmic sound of a metronome. The dancer moves, controlled and focused, against a backdrop of grey cubes. On the same kind of cubes in the exhibition room are some colorful and expressive textile carpets. In 2008, during a research visit to Israel, Sharon Lockhart (b.1964) discovered the remarkable work of Israeli dance composer and textile artist Noa Eshkol (1924–2007). While Eshkol could have chosen a life in New York, where art and dance flourished in the experimental and dynamic 1960s and 70s, she instead remained relatively secluded with a close group of individuals, creating dance compositions and textile art and ultimately developing a dance notation system with architect and collaborator Avraham Wachman. Lockhart’s research led her to a number of dancers from Eshkol’s group who continue her training at the composer’s home and studio outside Tel Aviv. It was there that Lockhart also unearthed a large number of Eshkol’s textile works, or “wall carpets.” Over the course of the following two years, Lockhart created a suite of work based on the story of Noa Eshkol, including serial photographs showing models Eshkol created to describe the Eshkol Wachmann movement notation system and a film installation with four of Eshkol’s dance compositions performed by Ruti Sela. 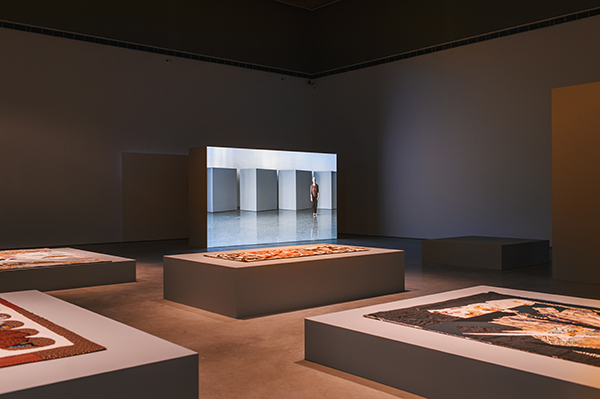 Lockhart’s photographs and single-channel installation are accompanied here by a selection of Eshkol’s wall carpets in a site-specific architectural intervention designed by her collaborators Escher GuneWardena. Sharon Lockhart’s participation in Body Talk is a prelude to a large-scale solo exhibi­tion of her work, which opens at Bonniers Konsthall in April 2014. During Body Talk, audiences will have a rare opportunity to see two live Stockholm debut performances of the late Israeli dance composer, theorist, and textile artist Noa Eshkol’s work. Four dancers from The Noa Eshkol Chamber Dance Group—ranging from their 30s to early 70s— travel from Israel to Stockholm for these special dance events. On Orientations/Untimely Encounters is part of a series in which An Kaler explores different notions of orientation in collaboration with different artists. In Untimely Encounters orientation is exploring touch: touch that appears detached from physical contact, touch that is exploring an intention or approach before actual contact is made. Following a first edition – the solo performance On Orientations l one place after – that focuses on the horizontal body in contact with the floor, the attention is directed towards different degrees of uprightness in Untimely Encounters. Consequently, An Kaler is working within a conception of processual choreography; the piece is as such intentionally “unfinished” – in each performance a set of potential postures, movement-sequences and spacial patterns/pathways are in negotiation. Light, space, sound and bodies form (temporal) coalitions and parallel movements that become entangled in and through the perception of the audience. 4 Dec 5-7 pm. Opening Body Talk. Free entrance. Welcome! 8 Dec 1 pm. Open rehearsal with Noa Eshkol Chamber Dance Group. No dance experience required. 19 Dec 7 pm. Koreografiska konstitutet; Coreographic tour of Body Talk. Free entrance. With support from The Israeli embassy in Stockholm. Bonniers Konsthall would like to thank TBA21Thyssen-Bornemisza Art Contemporary, Vienna and neugerriemschneider, Berlin.